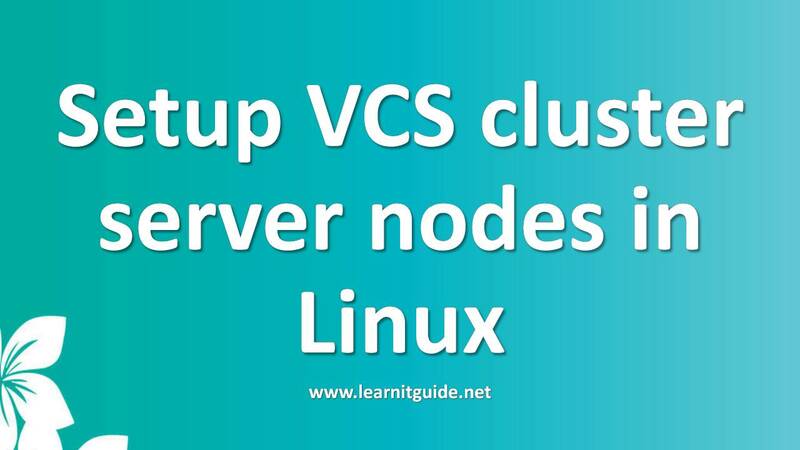 This article shows you to how to setup the basic VCS Cluster nodes on RHEL7 for high-availability server. 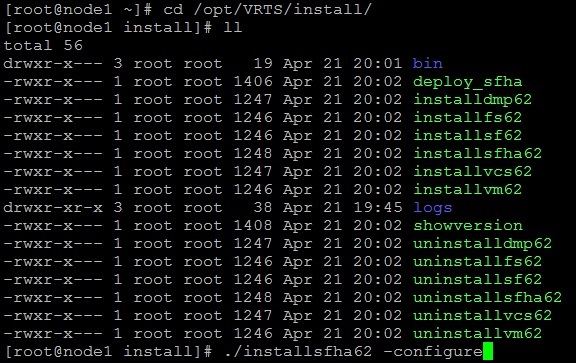 Already we have explained How to install Veritas Cluster server on RHEL7. 1. Start the initial configuration. 5. Configure the Virtual IP for the cluster. Once you all installed Veritas Cluster Server software, login into the first node (node1) and run the below command to setup the VCS Cluster. In the next screen, enter the system names separated by spaces as image shows below. here we enter node1 and node2. After verifying the systems, installer will prompt for IO Fencing settings in enabled mode. So press "n" to disable I/O Fencing in enabled mode.? When servers within the clusters become unable to communicate for any number of reasons, then Splid brain syndrome can occur. To avoid split drain syndrome, we can configure IO Fencing. But we disabled this io fencing because we have more network links. In the next screen, Press "Enter" to continue for configuring the VCS Cluster with our environment information. 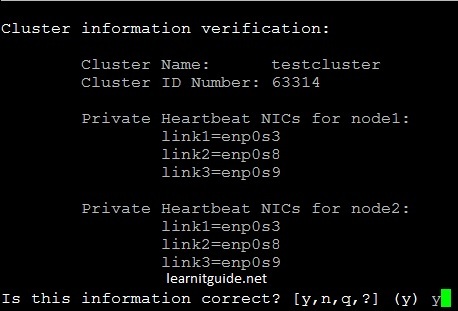 At the next screen, Enter the Unique Cluster Name, we give "testcluster" as shown in the image. At the next screen, installer will prompt for heartbeat links (LLT) network settings. 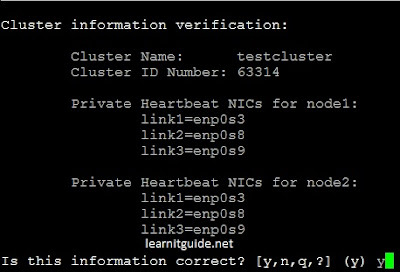 Two or more NICS per system used for heartbeat links, One or more heartbeat links are configured as private links and one links as a Low priority link. Select "4" option to automatically detect configuration for LLT over Ethernet and press "Enter". Installer will configure heartbeat links. At the next screen, Installer will give random ID or Enter a unique cluster ID. Press "n" to not check if the cluster ID is in use by another cluster. Next screen shows you the cluster information verification. Press "y" to accept the information as correct. Enter the NIC name for virtual IP of the cluster to use on node1 "enp0s3" and enter. Press "y" to confirm that "enp0s3" to be the public NIC used by all systems. Enter the Virtual IP address for the cluster as 192.168.2.50. Enter the Netmask for IP 192.168.2.50 as 255.255.255.0. Next screen shows you the cluster Virutal IP verification. Press "y" to accept the information as correct. Running VCS in Secure mode guarantess that all inter-system communication is encrypted and users are verified with security credentials. NIS and system usernames and passwords are used to verify identity. VCS usernames and passwords are no longer utilized when a cluster is running a secure mode. Press "y" to configure the VCS Cluster in secured mode. But we select "n" to disable the secure mode configuration in VCS Cluster. Press "y" to accept the default cluster credentials of 'admin/password'. Press "n" to not add another user to the cluster. Next screen shows you the VCS User verification. Press "y" to accept the information as correct. Press "n" to not configure SMTP notification, if you need notification then press "y". Press "y" to stop SFHA processes now and enter. Installer will stop and start the processes now. Now Symantec Storage Foundation and High Availability(VCS Cluster) Startup completed successfully. Press "n" to not view the summary file. Bedefault there is a servicegroup (ClusterService) configured where our Virtual IP has been configured to have high availability of the nodes (node1 and node2). Check ifconfig to confirm the virtual ip 192.168.2.50 configured or not and check the status of the cluster using "hastatus -sum" on node1. ClusterService group online and running on node1. So Virtual IP 192.168.2.50 also configured in node1. Lets switchover this service group to other node manually to test the configuration. Now Virtual IP 192.168.2.50 will be configured on node2. So end users can reach to the server using this virtual IP 192.168.2.50. In case of any failures with the member nodes, VCS Cluster will take care of switch overs. Thats all about the Initial configuration of Veritas Cluster server. In the next post, we will show you how to add service group in VCS Cluster for services with high-availability (Example: webserver, nfs servers and so on).